Stephen Kiprotich of Uganda celebrates as he wins the men's marathon on Sunday. Stephen Kiprotich was born 17 years after Uganda won its first Olympic gold medal. Fast forward another 23 years, and he has the honor of being the African nation's second athlete to triumph on sport's biggest stage. "I never saw John Akii-Bua run, but there are a lot of memories of him," Kiprotich told reporters after claiming a surprise victory in the men's marathon on the final day of London 2012. "I have been dreaming, 'Can I be like John Akii-Bua?' There is a time for everything, a time to train and a time to relax. I think today I joined the champions, so I am happy." The late Akii-Bua won Uganda's first Olympic gold at Munich '72, when he triumphed in the 400-meter hurdles. Leo Rwabwogo won boxing silver at the same Games, having won bronze four years earlier in Mexico when Eridadi Mukwanga took home silver. The greatest Olympic distance runner? But until Kiprotich's success on Sunday, its only other podiums were another runnerup placing in the ring for John Mugabi at Moscow '80 and bronze for 400m runner Davis Kamoga at Atlanta '96. 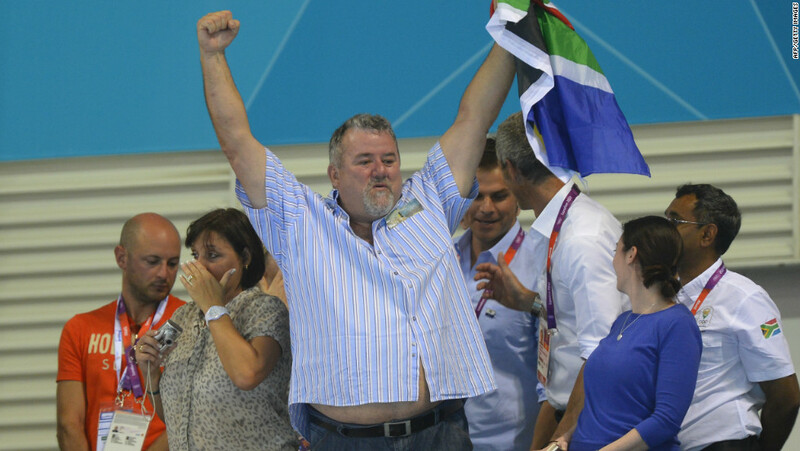 Memorable moments -- Ian Thorpe – For Ian Thorpe, watching the reaction from Bert Le Clos after his son beat Michael Phelps, the most decorated Olympian ever, was "one of those moments that you can't help but love." Thorpe says: "This big, burly South African man -- who looked quite frightening -- crying, tears rolling down his face, screaming at the camera: "It's my beautiful boy." Memorable moments -- Nathan Adrian – While many Olympians would choose the moment they won a medal, swimmer Nathan Adrian loved being part of the team that help fellow U.S. athlete Phelps get his final career gold: "My most memorable was going to be finishing up the relay with Michael that last night. The last swim of the meet, the last one of Michael's career. It's pretty fun to be a part of that." Memorable moments -- Max Seigal – "For me the Olympics always provides an opportunity for people who we expect to win... and the athletes who come onto the stage that no one expects," says Max Seigal. 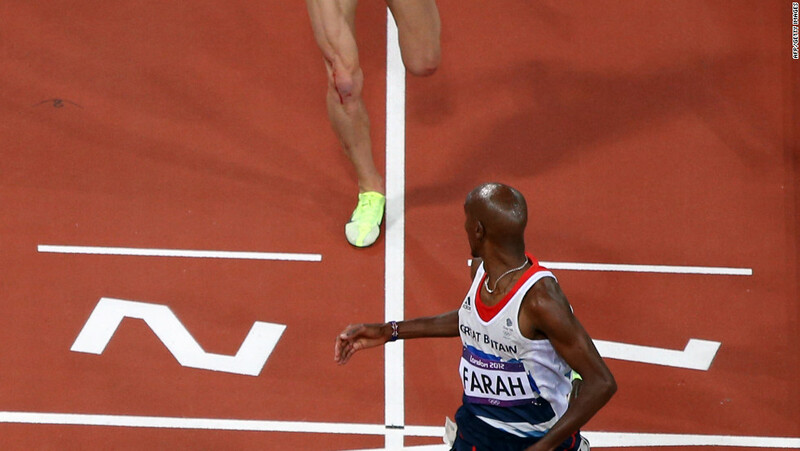 "Galen Rupp's performance in the 10,000 meters was one of those memories." Galen Rupp would finish hot on the heels of his friend and training partner, Team GB's Mohamed Farah, pictured here looking back at the U.S. athlete coming in second. Memorable moments -- Elena Isinbaeva – For Russian athlete Elena Isinbaeva, her most memorable Olympic moment was a personal one. 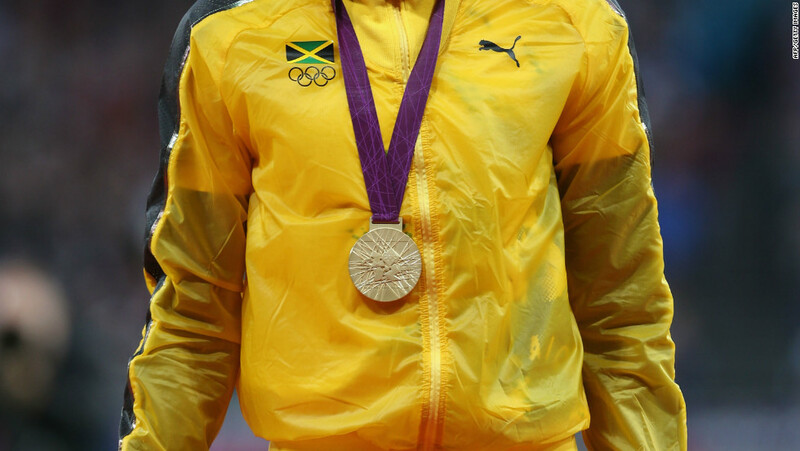 She reflects on her women's pole vault win: "Of course I will remember my bronze medal from the London Olympic Games. It was hard to win this medal, it was really hard." Memorable moments -- Linford Christie – Linford Christie's highlight is probably a fan favorite too: "My most memorable moment, of course, is when Usain Bolt came out to get his medal after the 100m, and the entire place just lit up," he says. "The roar of the crowd was ear-piercing. It was just wonderful, I was really glad I was there." Memorable moments -- Ali Raisman – U.S. gymnast Ali Raisman was proud of her gymnastics perfomance during the London Games. While she received a bronze medal in artistic gymnastics, seen here, she also won in other events. "I guess winning two gold medals and then that really exciting feeling of getting the bronze medal, like seeing that up on the score board was really cool," she gushed to CNN. Memorable moments -- Dan O'Brien – For Dan O'Brien, former U.S. American decathlete, Great Britain's Mo Farah winning the men's 10,000m is his most memorable moment of London 2012. "Mo Farah coming around the turn and Galen Rupp right on his heels. It brought me to my feet... It got me up on my feet and I was screaming." Memorable moments -- Ricky Berens – Ricky Berens' olympic moment was getting his gold with U.S. swimmers Ryan Lochte, Conor Dwyer and Michael Phelps for the 4 x 200-meter freestyle relay. Here Lochte, Dwyer and Berens react to their win. 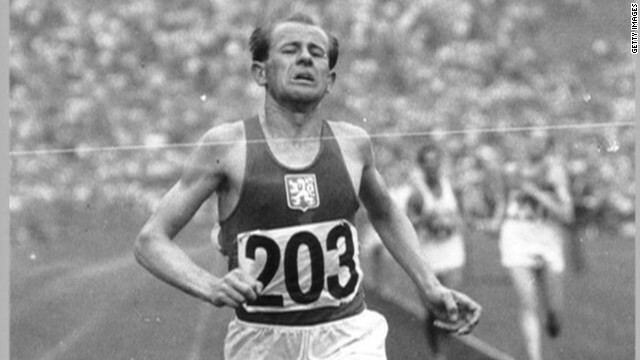 Track and field legend – Emil Zatopek pushed himself to the limit in search of Olympic gold and world records. 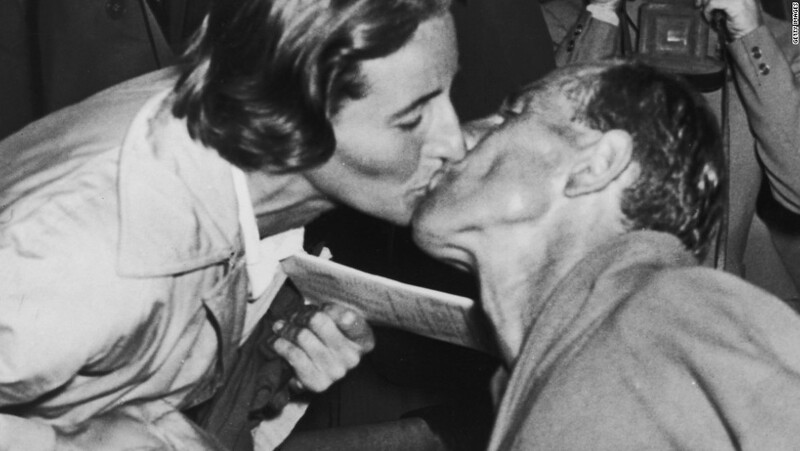 The Golden Couple – One of the most famous kisses in sports history as Zatopek was on his way to triple triumph in Helsinki and his wife Dana Zatopkova won javelin gold for Czechoslovakia. 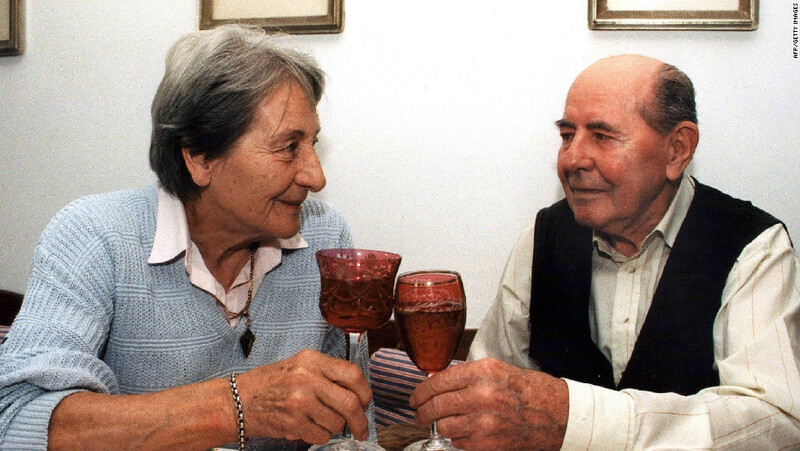 Golden anniversary celebrated – They celebrated their golden wedding anniversay in 1998, but Emil passed away two years later after a long period of ill health. 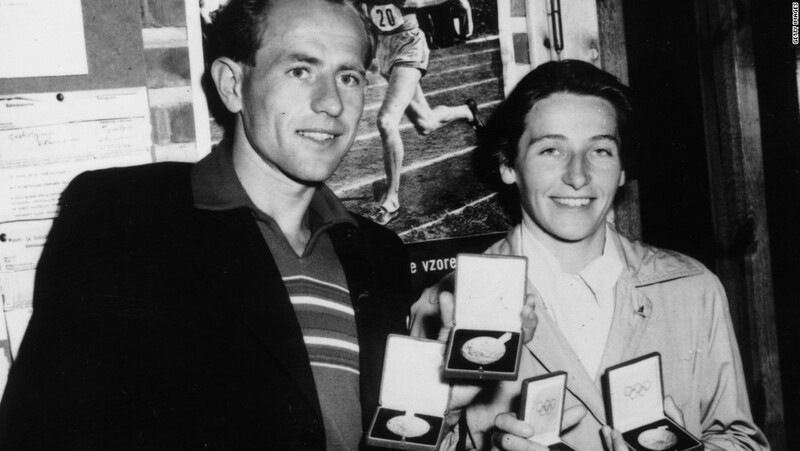 Celebrity status – The couple were widely honored for their many achievements in track and field spanning over a decade. 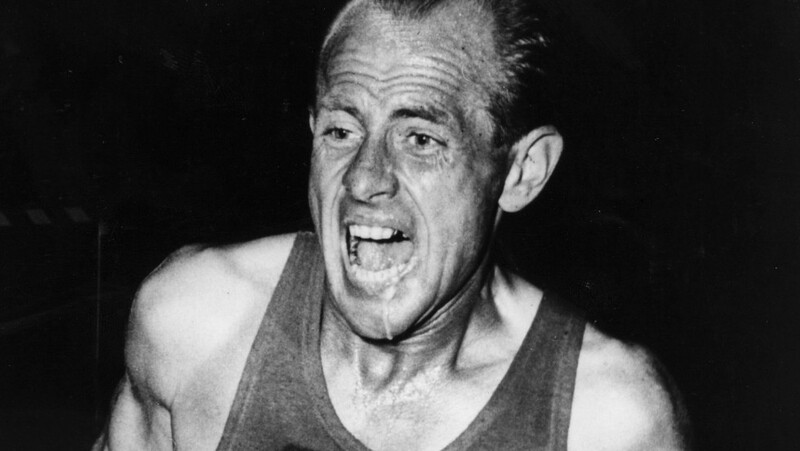 His first triumph – Zatopek wins the gold medal in the 10,000m at the 1948 Olympic Games in London -- his breakthrough victory. Treble triumph in Helsinki – Zatopek sprints to 5,000m gold in Helsinki from Alain Mimoun (France) and Herbert Schade (Germany) with Britain's Chris Chataway falling on the final bend. 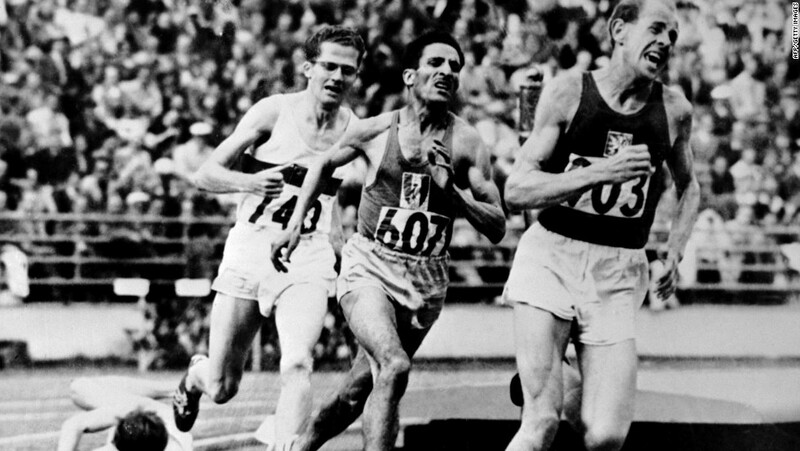 He also won the 10,000m and marathon -- a feat never repeated. 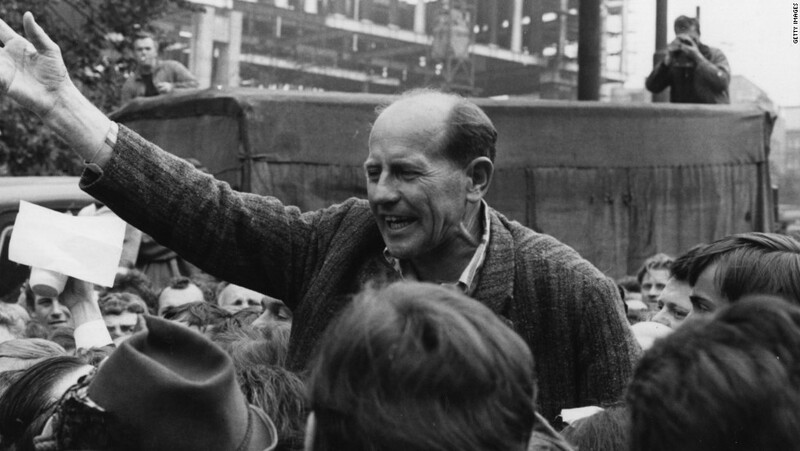 Man of the people – Zatopek addresses crowds during the Prague Spring of 1968, which was brutally repressed by Soviet troops. 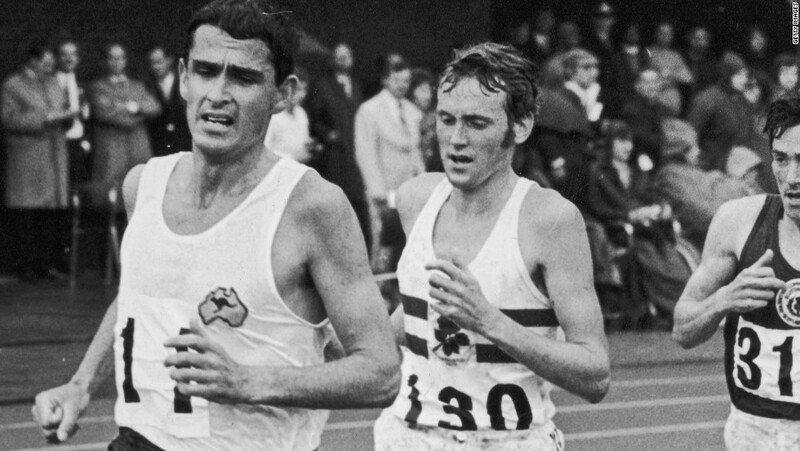 In Zatopek's footsteps – Australian runner Ron Clarke leads the 10,000m at the 1970 Commonwealth Games where he again missed out on the gold medal despite setting 17 world records. 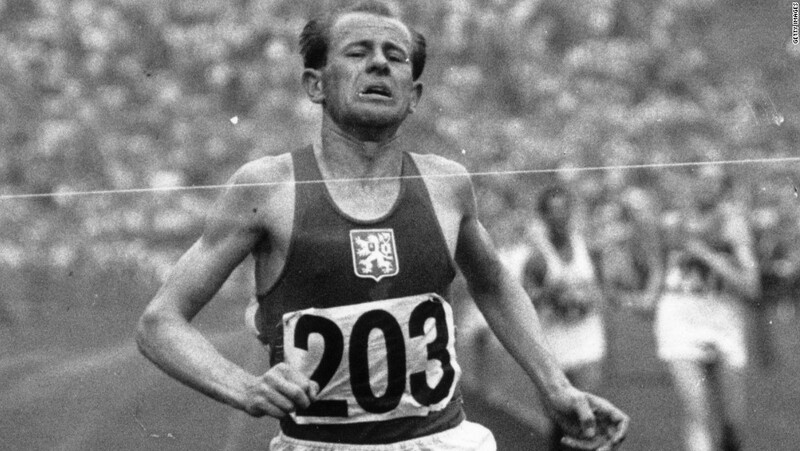 Zatopek was his inspiration and friend. Coached by Benjamin Longiross, who placed 62nd for Uganda in the marathon at Seoul '88, Kiprotich denied Kenya -- a country where he has trained in recent years -- a second successive men's title. Two-time world champion Abel Kirui had to make do with silver, while fellow Kenyan Wilson Kipsang claimed bronze. Kiprotich made his move after 38 of the 42 kilometers, bursting clear before taking a Ugandan flag from the crowd as he crossed the finish line in a time of two hours, eight minutes and one second. "When the race started I thought the Kenyans would win," Kiprotich said. "I kept in touch and then I thought, 'Let me move', so I moved. "When we came to within three miles, then I started to go on strongly." Kipsang, who won the London marathon in April, opened up a 21-second lead at one stage but later suffered in the hot conditions. "When Kipsang and I were together, I thought we were the only ones who would fight for the gold," said Kirui, who finished 26 seconds behind Kiprotich. "I thought I was going to sprint with Kipsang in the final kilometers. Surprisingly, I saw Stephen with us and it was difficult to make a move. "He stayed with us for a long time and he made a stronger move in the end. We were closing the gap but couldn't catch him. I am happy for him." The race also featured U.S.-based South Sudanese runner Guor Marial, who finished 47th after entering as an independent competitor. © 2016 Cable News Network. Turner Broadcasting System, Inc. All Rights Reserved.